Looks like the bronze birch borer has done its destructive work. One of the Eugene TV channels had a story about the bronze birch borer the other day. I only half listened, but the story rang a bell, so I looked this insect up. Too late. The damage has been done. 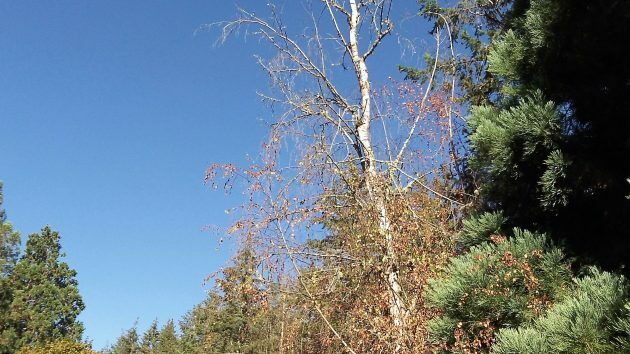 This pest, it turns out, has been destroying birches in Oregon for 10 or 20 years. The Oregonian ran a story about it in 2010. Owners of birch trees can try to prevent the damage by taking measures to keep their trees healthy. But in my case, I wasn’t paying attention. Birches have shallow roots and grow best in moist and cool soil, I learned from checking online. So you’re supposed to mulch around the tree and, in hot weather, give your trees plenty of water. Also, you’re supposed to prune dead branches and destroy them to get rid of borer larvae before they mature and multiply. Having done none of those things, I’m now looking at a couple of mature birches that are either dying or completely dead. Other birches in the neighborhood look like they’re in about the same shape. Yes, the problem has been growing for 10 to 20 years for a shallow rooted tree that prefers cooler soil. Soils get warmer when the total annual heat load gets higher, and more water is needed to keep up When one tree dies it could be anything. When a die-off is regional, it’s probably due to changes in the ecosystem of the region. It’s just another symptom of the climate changes that are occurring. Trees are the “new” canary in the coal mine. Ya mean there’s side-yard evidence of climate change right here in Hub City?? ?